Pathtags are personal trading items. 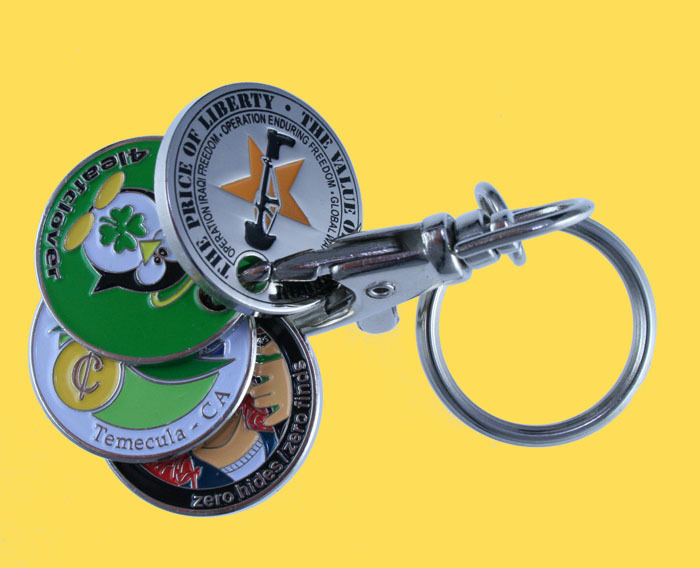 Used most often in Geocaching, they are also very handy for Scouting, Military and Promotional use. Our online gallery displays many of the thousands of tags which have been designed by individuals and produced by us. This page provides a more detailed introduction to what Pathtags are. There are lots of detailed photos, please be patient while they load. The physical Pathtag integrates with our online community to enable collecting and trading of tags with others from all over the world. To learn about the Pathtags Community, visit the Pathtags Community Tour. There are Pathtags accessories, like the Pathtag Sherpa Geocoin, which turn the Pathtag into a traveling item. In these cases, they are intended to stay with the coin or travel bug to which they are affixed and should be moved along like another traveler. Pathtags are produced from your own personal design. When you order your Starter Kit, you will be prompted to upload a design from your computer. Pathtags are really easy to design and many owners design their own tags. If you don't feel up to the challenge, check out our Design Page for tips and links to our Design Partners. Design Partners are professionals skilled in the rendering of Pathtag designs. They will help you by producing your design for a nominal fee (typically $25 or $35). The reverse side of the tag is home for your tag's unique serial number. This serial number allows you to enjoy the features of the accompanying online Community. The Pathtags Community is free to access by anyone who finds your tag. As an owner you will have access to all the unique features of the Pathtag Community. These features include a great trading management tool, an online collection tool, and the ability to see who has your tag and where they found it. Click here to visit our Pathtags Community Tour to learn more about its great features! Each tag has a hole punched in it, this hole serves two functional purposes. First, it allows you to easily display your tags on a peg board (shown below). Also, the holes enable you to clip tags to collector clips or other storage mechanisms. Some people use ball chains or even shoelaces in a pinch to keep their tags together. Because Pathtags are made from an iron base, they are also attracted to magnets. This lets you display your collection in a lot of unique ways. Some people buy small round magnets and display them on a fridge, filing cabinet, or white board. Once you place your order and upload your design, we manage the production for you, keeping you informed as your tag moves through each stage. 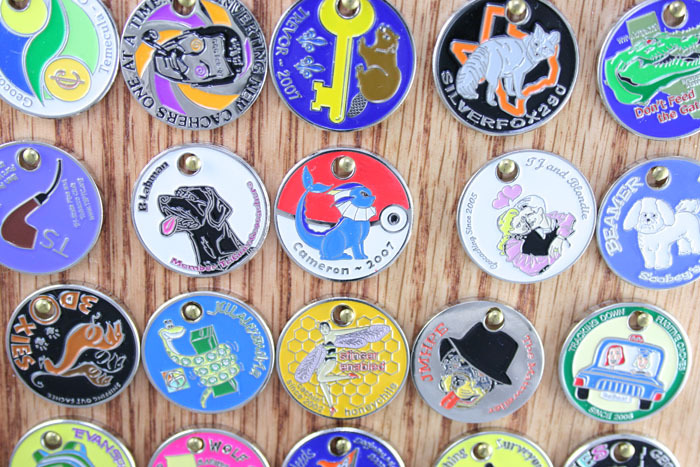 To learn all about how Pathtags are created - visit our Pathtags Creation tour. The end product of our patent-pending process is a very durable, extremely attractive item.